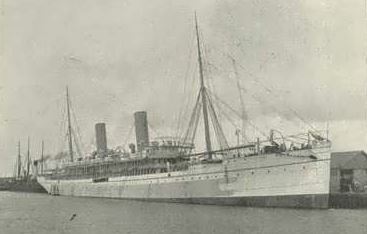 The first of many ships built by Harland & Wolff for Union-Castle and, at the time, the largest ship on the Cape Town mail run. She was considered to be well ahead of any other ship on the route in terms of facilities and comfort at the time. She was refitted by Harland & Wolff in 1904 with accommodation for 170-1st, 108-2nd and 120-3rd class passengers and subsequently worked as a mail ship until 1910 when, after being replaced by the Balmoral Castle, she was laid up at Netley in Southampton Water. At the outbreak of the First World War in 1914 she was re-commissioned as a troopship for a short while before reverting to the mail run. During this time she was part of the first convoy to take men of the British Expeditionary Force to France. 1918 saw her on troopship duties again, this time in the Mediterranean.